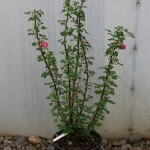 A West coast native shrub with 3" long racemes of bright pinkish-red flowers in early spring. 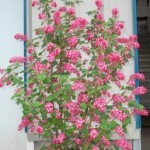 In summer, it will have bluish-black berries. 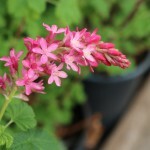 It prefers moist soil, including sandy or clay, as long as it is well-drained. It will take some drought once established, performing better with some water during dry summers. Tolerant of some shade, but the best flower display is in full sun. Prune as needed for form; it can sucker to form a small patch.